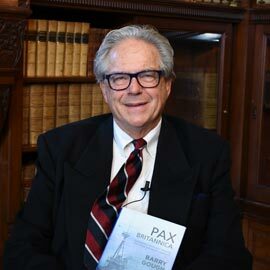 WATERLOO – Wilfrid Laurier University’s History Professor Emeritus Barry Gough was honoured at the Maritime Media Awards with the Mountbatten Award for Best Literary Contribution for his book, Pax Britannica: Ruling the Waves and Keeping the Peace before Armageddon (Palgrave Macmillan). This is the first time that a non-UK citizen has received the award. Gough’s Pax Britannica covers the history of the British Empire between 1815 and 1914, illustrating the immensity of Britain’s global ambition and the controlling influence of the Royal Navy. The book explores the Royal Navy’s application of new industrial technologies, rule of law, missionary work, education and hope as prime movers in the navy’s struggle to abolish slavery, discover distant seas, explore coasts and continents and promote free trade. Jury members commented that Gough’s book was a substantial essay on globalism in the 19th and early 20th centuries and praised the work as balanced, judicial and comprehensive – a unique achievement considering the vast topic. “Pax Britannica represents the work and distillation of ideas and research of a lifetime,” said Gough. Gough’s book was the winner against 25 books shortlisted. The Maritime Media Awards celebrate excellence in British maritime literature, journalism and filmmaking. Gough was a history professor at Laurier from 1972 to his retirement in 2004. He is the author of several works including Historical Dreadnoughts: Arthur Marder, Stephen Roskill and Battles for Naval History (Seaforth). He is archives fellow at Churchill College in Cambridge and a fellow of King’s College London. He is a past president of the British Columbia Historical Federation.